Lows And Highs is a sound lightly raced 4YO mare by High Chaparral, the sire of the great So You Think and Its A Dundeel. 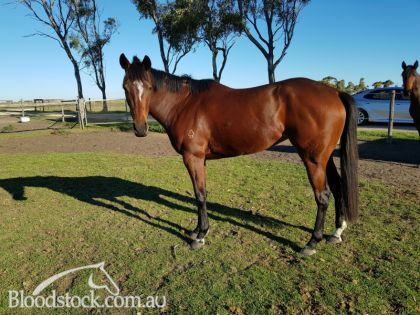 She is out of a More Than Ready mare (as was Miracles For Life and Rebel Dane) and she is from the famous international family of Smart Strike, Dance Smartly etc. This young mare, has a good temperament, she is sound, lightly raced with residual value as a broodmare. All at a reasonable price. HIGH CHAPARRAL (IRE) (Bay 1999-Stud 2004). 10 wins-2 at 2, The Derby, Gr.1. Champion Aust. Sire (AEI) twice. Sire of 1695 rnrs, 1055 wnrs, 119 SW, inc. So You Think (MVRC WS Cox P., Gr.1), Dundeel, Shoot Out, Ace High, Descarado, Monaco Consul, Rekindling, Contributer, Toronado, Wigmore Hall, Lucky Lion, Free Eagle, Tivaci, Redwood, Youngstar, Charmont, Fenway, High Jinx, Hiyaam, Montoya's Secret, Pondarosa Miss, Wrote, Joanna, Enaad, etc. Bernie (g by Bernardini (USA)) Placed at 3 in 2016-17, 2d SAJC Adelaide Cup Raceday H.
Almindoro (g Redoute's Choice) 2 wins at 1500m, 1600m, A$141,438, MVRC Fisher & Paykel P., 2d MRC Norman Robinson S., Gr.3, VRC Super Impose S., L, 3d MRC Autumn Classic, Gr.2. No Doubt (g Not a Single Doubt) 2 wins at 1200m, A$152,850, in 2016-17, 2d ATC Doncaster Prelude, Gr.3, FIIG H., Schweppes H., 3d ATC Robrick Lodge H.
D'Don. 5 wins at 1000m to 2017, Singapore TC Class 5 H.-5 times, 2d Singapore TC Class 5 H., 3d Singapore TC St. James's Palace S., Lim's Racer S., Class 5 H.-twice. Antonio's Pride. Winner at 1600m in 2017-18 in Aust. JADE BAY (g Jallad) 7 wins-1 at 2-at 1000m, 1150m, R743,275, to 2016-17, Turffontein Lebelo Sprint, Gr.3, Greyville Umngeni H., L, Vaal Grand Heritage in October H., Family Entertainment H., Turffontein District Grand Lodge P., Applied Pneumatics H., 2d Turffontein All to Come S., Wishing You All the Best for the Festive Season P., Vaal Pinnacle S., Rugby 5 H., Racing Association P., 3d Turffontein Pinnacle S., World Sports Betting H., July Day in Jozi Juvenile P., 4th Turffontein Computaform Sprint H., Gr.1, Golden Loom H., L.
HILLHOUSE HIGH (f Exchange Rate) 4 wins-1 at 2-at 7f, 1m, US$456,803, to 2017, Santa Anita Royal Heroine S., Gr.2, 3d Santa Anita Goldikova S., Gr.2, Buena Vista S., Gr.3, Woodbine Duchess S., L, Gulfstream Park Wait a While S., L, Saratoga Tenski S., L, 4th Del Mar Yellow Ribbon H., Gr.2, Santa Anita Wishing Well S., L.
SKY CLASSIC (c Nijinsky) Champion 2YO colt in Canada in 1989. Top colt on The 1992 USA 4YO+ Free H. 15 wins-4 at 2-from 7f to 1½m, US$3,240,398, Woodbine Rothmans International S., Gr.1, Belmont Turf Classic H., Gr.1, Early Times Manhattan H., Gr.2, Atlantic City Caesars International H., Gr.2, Arlington H., Gr.2, Woodbine Summer S., Gr.3, Grey S., Gr.3, King Edward Gold Cup, Gr.3, Pimlico Early Times Dixie H., Gr.3, Woodbine Connaught Cup, L, 2d Breeders' Cup Turf S., Gr.1, Woodbine Rothmans International S., Gr.1, Arlington Million S., Gr.1, Churchill Downs Turf Classic S., Gr.3. Sire. ALWAYS A CLASSIC (c Deputy Minister) 6 wins, US$388,648, Churchill Downs Turf Classic S., Gr.1, Fair Grounds Explosive Bid H., Gr.3, Mardi Gras H., L, 3d Belmont Manhattan H., Gr.1. Sire. REGAL CLASSIC (c Vice Regent) Champion 2YO colt in Canada in 1987. 8 wins-4 at 2-from 1m to 9f, US$1,456,584, Woodbine Grey S., Gr.3, Summer S., Gr.3, Eclipse H., Gr.3, 2d Breeders' Cup Juvenile S., Gr.1, 3d Keeneland Blue Grass S., Gr.1, Hollywood Futurity, Gr.1. Sire. GREY CLASSIC (c Grey Dawn) Champion 2YO colt in Canada in 1985. 7 wins-4 at 2, US$602,039, Woodbine Summer S., Gr.3, Laurel Turf Cup, Gr.3, Woodbine Connaught Cup, L, Coronation Futurity S., L, Cup & Saucer S., L, 3d Arlington H., Gr.1. MORENO (g Ghostzapper) 4 wins from 1m to 9f, US$2,992,190, Saratoga Whitney H., Gr.1, Belmont Dwyer S., Gr.2, Charles Town Classic S., Gr.2, 2d Saratoga Travers S., Gr.1, Woodward S., Gr.1, Santa Anita H., Gr.1, Belmont Suburban S., Gr.2, Santa Anita Californian S., Gr.2, Parx Racing Pennsylvania Derby, Gr.2, 3d Saratoga Jim Dandy S., Gr.2, Fair Grounds New Orleans H., Gr.2, Charles Town Classic S., Gr.2. DANCE WITH RAVENS (c A.P. Indy) 3 wins-1 at 2-from 8½f to 9f, US$340,600, Woodbine Grey S., Gr.2, Plate Trial S., L, Allowance, 2d Woodbine Summer S., Gr.2. Sire. SCATTER THE GOLD (c Mr. Prospector) 2 wins at 9½f, 1¼m, US$845,854, Woodbine Queen's Plate S., L, Fort Erie Prince of Wales S., L. Sire. SMART STRIKE (c Mr. Prospector) 6 wins from 7f to 9f, US$337,376, Monmouth Philip H Iselin H., Gr.1, Salvator Mile H., Gr.3, Woodbine Allowance-twice, 4th Belmont Woodward S., Gr.1. Champion sire. FULL OF WONDER (c Mr. Prospector) 5 wins from 8½f to 1½m, US$368,150, Woodbine Niagara H., Gr.1, Allowance. STRIKE SMARTLY (c Mr. Prospector) 5 wins from 8½f to 11f, US$470,310, Woodbine Chinese Cultural Centre S., Gr.2, Allowance, 2d Woodbine Sky Classic H., Gr.2, 3d Woodbine Niagara H., Gr.2, 4th Woodbine Niagara H., Gr.1. Sire. AFRICAN RIDE (c Candy Ride) 3 wins from 1300m to 1600m, €88,750, to 2018, Chantilly Prix Montenica, L, 2d Deauville Prix de la Porte Maillot, Gr.3. HELLO SEATTLE (f Deputy Minister) Champion 2YO Filly in Canada in 1999. 2 wins at 2, Woodbine Mazarine S., Gr.1, 4th Woodbine Princess Elizabeth S., L.
HIS RACE TO WIN (c Stormy Atlantic) 5 wins at 8½f, 9f, US$509,349, Woodbine Ontario Derby, Gr.3, Seagram Cup, Gr.3, 2d Woodbine Durham Cup, Gr.3, 3d Woodbine Dominion Day S., Gr.3. HAPPY SPRINT (c Ammirare) 10 wins-5 at 2-from 1200m to 2000m, 262,900,000¥, to 2018, Kawasaki Zen-Nippon Nisai Yushun, L, Monbetsu Hokkaido Nisai Yushun, L.
SILVER TICKET (g Silver Deputy) 4 wins-1 at 2-from 1m to 9f, US$504,967, Woodbine King Edward H., Gr.2, Toronto Cup, Gr.3, Allowance, 2d Woodbine Cup & Saucer S., L, Labeeb S., L, 3d Woodbine Connaught Cup, Gr.3, Breeders' S., L, Keeneland Storm Cat S., L.
Race Record: 3 Starts 0-0-0 A$750. 26/May/2017 9th of 9 --trial--Balaklava RC Barrier Trial, 1000m. Quideem was 1st and Modulate 2nd and Secret Bar 3rd. 28/Sep/2017 9th of 9 --trial--SAJC Barrier Trial, 1000m. Cruising was 1st and Futago 2nd and Deplorable 3rd. 24/May/2018 7th of 8 --trial--SAJC Barrier Trial, 1000m. Eclair Lightning was 1st and Cosmic Impact 2nd and Champagne Victory 3rd. (10.7) SAJC AAMI P., A$21,700, 2025m, time 2:10.75. Track soft(7). Carried 55.00kg. Super Swoop was 1st and Puradeanie 2nd and Exalted Lucifer 3rd. Trainer: Grant Young. Owner: Mr B A Scott. Jockey: J Holder. 10/Aug/2018 8th of 8 --trial--Gawler & Barossa JC Barrier Trial, 1000m. Streetcar Express was 1st and Cosmic Alert 2nd and First Kiss 3rd. (6.0) Balaklava RC Joyce Fisher Maiden P., A$13,000, 2200m, time 2:24.18. Track soft(5). Carried 56.00kg. Exalted Lucifer was 1st and Manilow 2nd and Shirley's Eagle 3rd. Trainer: Grant Young. Owner: Mr B A Scott. Jockey: J Holder.